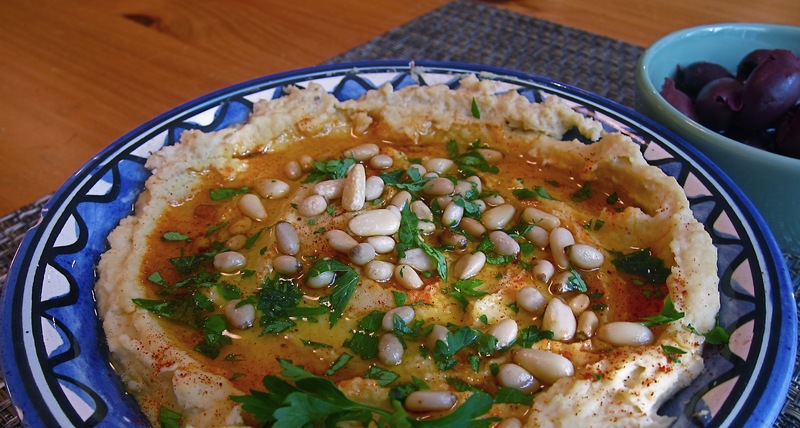 One of our favorite dishes as a family is hummus. And it is a great way not just to start this blog, but to start the New Year, because the round chickpeas are frequently cooked at the Jewish New Year to symbolize the circling around of the calendar. We come by our love of hummus honestly – two years ago we spent a school year in my husband’s hometown of Tel Aviv and had some of the best hummus in the known universe. However, there are several blogs devoted to the best hummus in Tel Aviv, so let’s move on the homemade version, which is surprisingly easy. Soak the garbanzo beans overnight, cook the next day with 1 teaspoon of Baking Soda and an Onion for an hour or until soft. In the Vitamix (topic for another post), blend the toasted sesame seeds, lemon juice, cooking liquid, garlic, salt and cumin seeds for 60 seconds. You will get a delicious tahini paste. Remove the onion from the garbanzo beans cooking pan, set 1/2 cup of whole beans aside. Add the rest of the beans to the Vitamix, and 60 seconds later the Hummus will be ready. Put the mixture into a bowl, swirl the top with a spatula to make spiral grooves, pour a little olive oil, sprinkle whole beans, pignoli and paprika. We sometimes make homemade pita, but you can buy pita everywhere – or we cut veggies for dipping. This does not resemble store bought hummus in the least and is absolutely delicious. This entry was posted in Uncategorized and tagged Chickpea, Cooking, Cumin, Garlic, hummus, Olive oil, Sesame, Tel Aviv. Bookmark the permalink. Jack, thanks for the comment. If you don’t mind, I’ll refer you to the competent hands of Aryeh who is our resident research expert and would be DELIGHTED to respond.